Super featherweight prospect Andy "El Tiburon" Vences (18-0) promises a much better performance when he faces Eliseo Cruz Sesma (11-3-1) on Saturday night at the Microsoft Theater in Los Angeles. The fight takes place underneath the Vasyl Lomachenko-Miguel Marriaga main event. The Bay Area product won a 10 round unanimous decision in his previous fight in March against Angel Hernandez but wasn't happy with the way he fought. He feels that he lost the weight too fast for the fight and didn't feel strong in the ring. That performance led to changes with the way he handles his fight preparation. "Training camp was good, man. I did everything right this time. I had enough time to get ready and I am losing the weight the right way. I have added a lot of different training to my camp so it should be good all around this time as far as my performance. I can't wait," said Vences. The fight card will be the second installment of Top Rank's new venture with ESPN. The network has televised boxing for years but now will be a major player in the sport. Manny Pacquiao's surprising loss to Jeff Horn was the first fight as part of the deal and produced huge ratings. On August 19th Terence Crawford and Julius Indongo will unify all four major belts in the super lightweight division in what will be the third ESPN event. 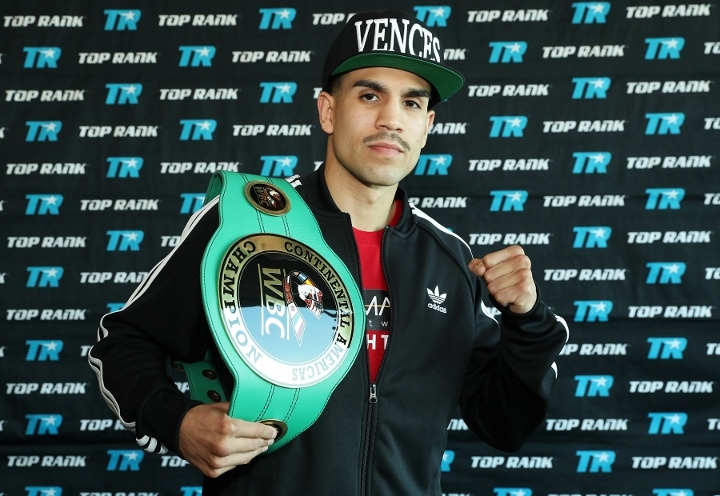 Vences fought several time on UniMas' Solo Boxeo series which was Top Rank's Spanish language outlet for the past several years. While he is thankful for those opportunities, he is beyond excited about the prospects of fighting on the World Wide Leader in Sports. "It is big. I had heard rumors about it but once it got finalized - and now I guess Crawford and Lomachenko pretty much left HBO to go ESPN - so it is huge. Top Rank is really the promoter to be with. Especially after this move. This is going to change the platform for us. I loved UniMas and everything they did for us but it was only so far you could go before jumping to HBO or something bigger. Fighting on ESPN we are going to be exposed to I don't know how many millions of viewers. It is just big and not only for me but all of the other fighters on Top Rank who will be fighting on such a big platform," Vences told BoxingScene.com. The 26-year-old hopes to remain very active and wants to be back in action as soon as possible after his next bout. "I will take a week and half off then right back to work in the gym. I just want to get a little rest and then get right back in the gym and depending on the performance hopefully I get right back in the ring soon," he explained.